If you want to get paid for your public speaking engagements then you need to know what professional speakers know. This video teaches you how to use a little known tip to increase your chances of getting higher rankings for your videos. Attention Marketers: I Don’t Know How She Did It…. it would take me all day. Ka-ching sound on the phone. Was the job done quickly without any hassle on my part? …..YES! would estimate at least 5 million bucks since she did it. it easily for practically pennies. making you feel bad about it. some kind of emergency disaster call to me. 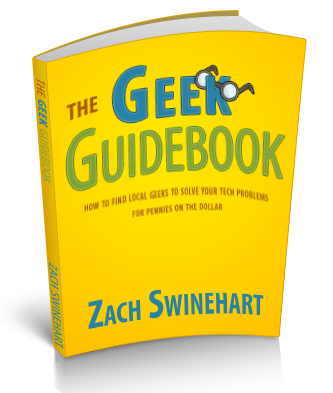 Zach Swinehart, and his “Geek Guidebook”. have such a profound effect on your business. customizable templates to find the perfect geek(s) for you. you work on the important stuff. So we have created all of these profiles and loaded them with content…now what? The entire idea of using social networking is to actually “network” with the other members. Through networking you can make huge strides in promoting your services. You can meet like-minded people and drive serious traffic to your websites with the links you provide for others. The new term for this that is really starting to catch on is “interactive marketing.” This describes Internet marketing that is personal in nature. You visit networks or groups where targeted people frequent and strike up a dialog with them. You can also offer advice to selected people in such a way that everyone can benefit from it and most of all, you can remember and store what people say and create promotional material bent towards that information. • Join groups of like-minded people. • Leave comments with a link to your resources on the group wall. • “Like” or fan many Facebook business pages. • Leave comments with a link to your resources on the business page wall. • Leave comments on other people’s comments. • Recommend friends to others that you feel may benefit from the meeting. • Tag people in your photos, videos and notes. • Offer a contest to name your book or system. • Copy or print Instant Messages or comment threads for future reference. Where can you find the newest tips on marketing? There are a ton of new career choices because of the Internet. Commerce and marketing has expanded it’s horizons. Learn how you can discover the hottest and most in demand jobs available today. At the Internet Marketing Training Center of Virginia, you can get a dedicated certificate in as little as six months and be on your way to a great job. Visit the site to download your free career guide. Don’t let the reader get away without giving you their email address. It takes alot of work to get them to your blog in the first place. The blog is not the “end point” of your marketing, your opt-in or sales letter is. The blog creates interest in your business or service, and quality posts can entice the reader to make a further decision or conversion. Not only that, the search engines love “anchor text” or clickable links made of keywords. Don’t leave links that just have your URL or “click here.” Use a strong call to action and reward your reader with addtional quality info and they will give you something in return. Claim the step-by-step formula that will make you successful on the web. Learn how a scumbag from Denver tried to bad mouth me and put me out of business but made me millions of dollars instead.